As if we didn’t know already, David Beckham is a way cool dad. Remember when he reminded his son Brooklyn that he has more Instagram followers (#SorryNotSorry, Brookylyn!)? Or that time he adorably taught his daughter Harper how to ride a bike? ALL THE AWWWs. Well, our latest reminder comes from a picture wife and champion of our Spice Girl-loving hearts Victoria Beckham posted on Instagram. 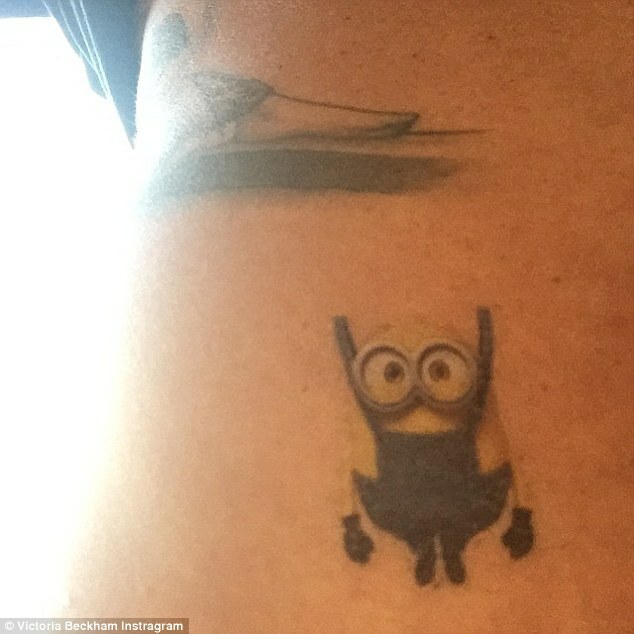 Apparently Becks let Harper pick out his latest tattoo, and I guarantee it’s not what you’re expecting. Who knew David Beckham still had skin left to ink? Well he does, and it’s obviously in good hands with Harper. The tattoo she chose is—wait for it—a Minion. Yes, that Minion, goggles and all. “Harper has just added to Daddie’s tattoo collection x happy Tuesday in the sunshine! X vb,” Victoria captioned the pic. Unfortunately the tat is temporary, but Posh Spice’s mini-me does still own some prominent tattoo real estate: Becks has her name inked on his left side, which is adorable. Maybe with a little convincing, he could make the Minion permanent? I smell a Kickstarter. Real or fake, it’s a pretty fantastic tattoo. I applaud your choice, Harper, and hope you get to play “Pick Dad’s New Tattoo” again soon. It sounds like a fun game!